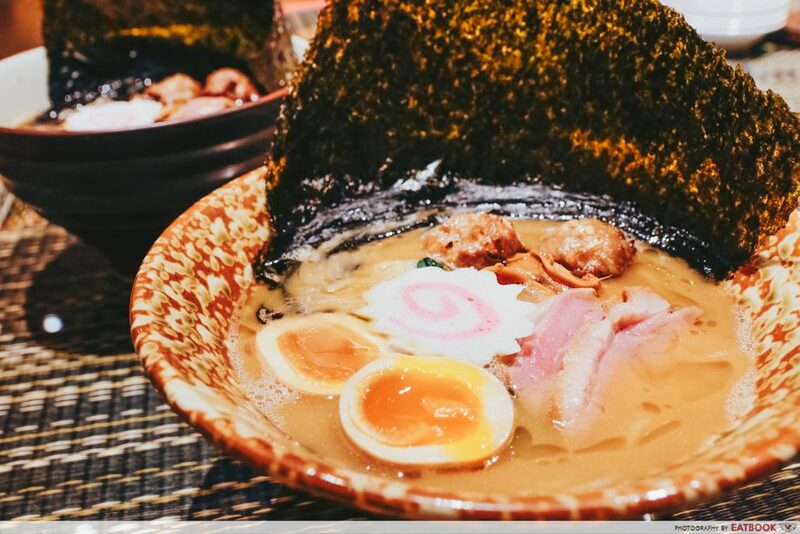 When it comes to ramen in Singapore, I always find myself heading to one of Chef Keisuke’s outlets. Perhaps it’s because my first good experience with ramen was at his Bugis outlet. Prior to that, I was the ultimate ramen hater, liking the comforting Japanese noodle dish to Maggie mee. 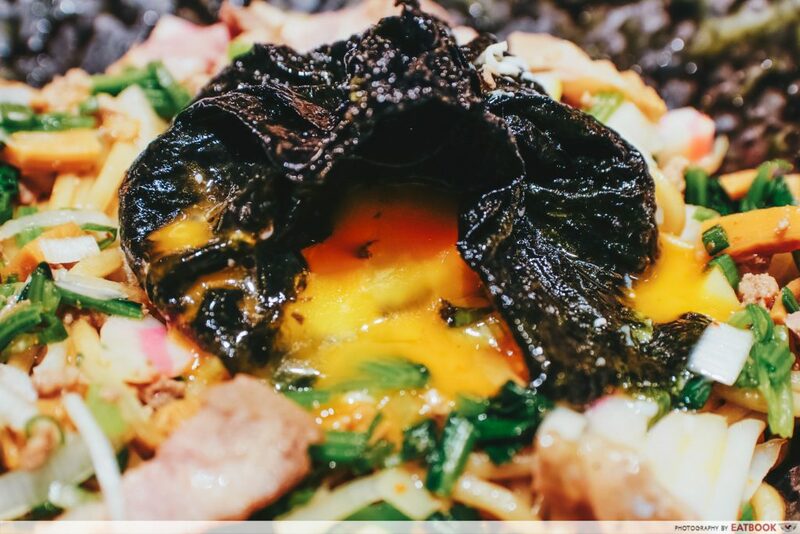 Well, Chef Keisuke proved me wrong and since then I’ve been a loyal follower of his endless concepts, from Hamburg Steak Keisuke to his all-new, duck ramen restaurant in Holland Village, Kamo Soba Keisuke. Having tried Chef Keisuke’s lobster ramen, truffle ramen, and tonkotsu ramen, my expectations for his duck ramen were high. 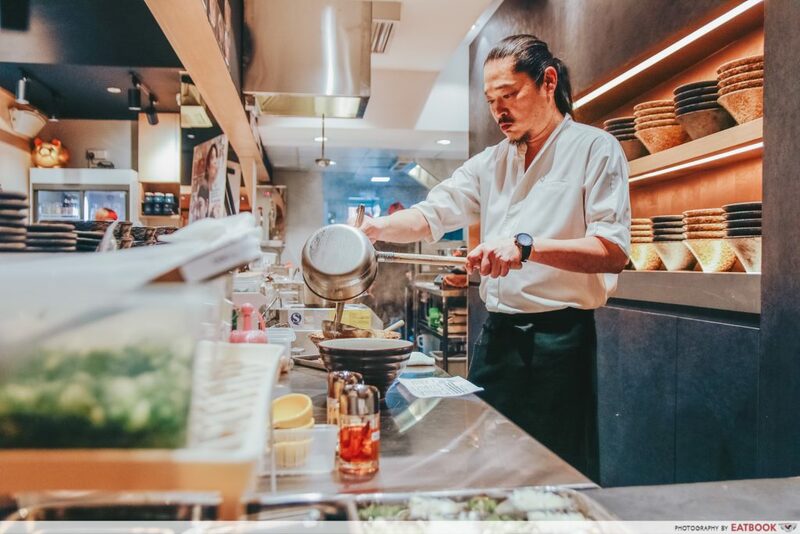 Plus, since this is Keisuke’s second duck ramen restaurant – the first being located in Ginza, Tokyo – I was pretty confident it would do well. 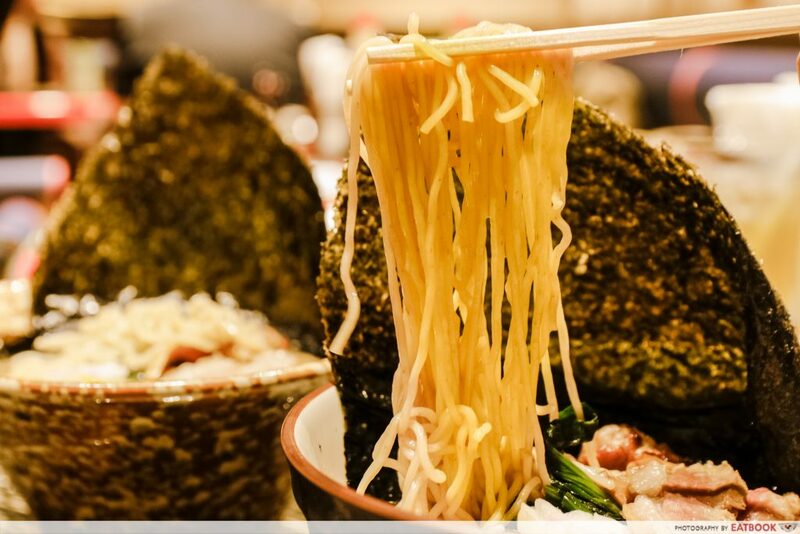 After all, it should mean something if the concept is able to survive in Japan’s competitive ramen landscape, where duck is not commonly eaten, right? We were first served the Special Hybrid Duck Broth Ramen ($19.90++ each), in both Clear and Rich. 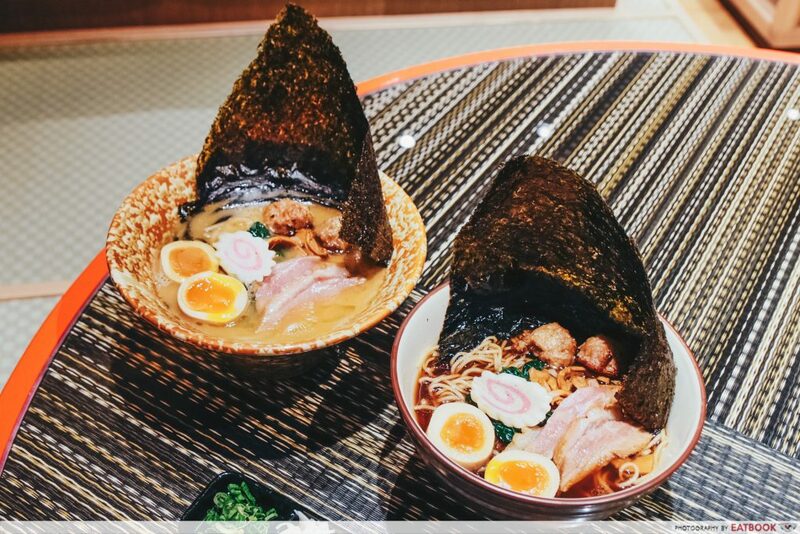 An up-sized of the regular version, the bowl came filled with bamboo shoots, a marinated soft-centred egg, two slices of fatty duck and two yuzu duck meatballs. Simmered over low heat for five hours, the clear soup was light yet loaded with umami notes. Its flavour straddled between the rich pork-bone broth I was so used to and the more delicate chicken ramen broth. The accompanying thin, ribbon-like noodles were a delight to slurp up too, and if I had one whole bowl to myself, I would have easily finished it in under 10 minutes. But if you prefer something heavier, the rich broth will really hit the spot, especially on a rainy day. The broth is thickened by adding more duck bones to the mix and simmering it over high heat for eight hours. This causes the connective tissues and collagen to melt and convert into gelatin, making the once clear concoction creamy and milky. The noodles here are slightly thicker as well, allowing the robust stock to cling onto each strand. When polled, it turned out that the majority of my younger companions preferred the rich broth, while those with a more mature palate preferred the clear soup. 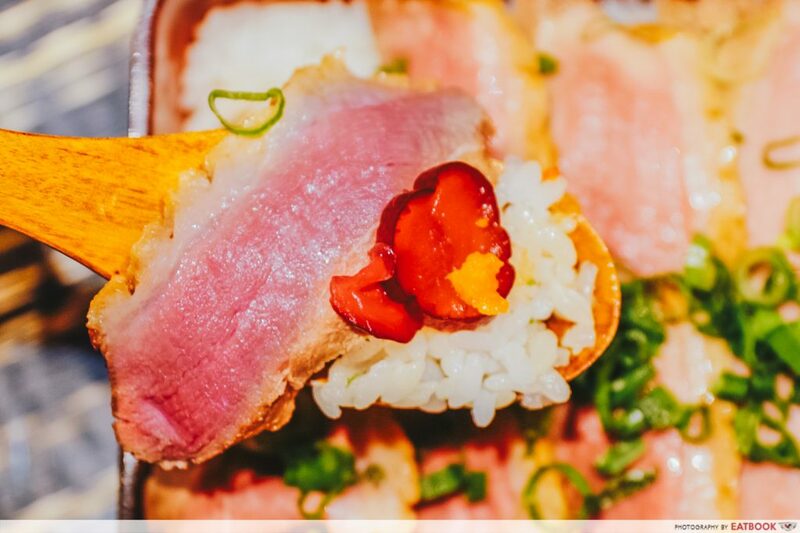 Grilled first to give the skin a nice char, Keisuke then marinates the Irish hybrid duck in a house-made shoyu-based sauce before steaming it at precisely 65-degrees Celsius. 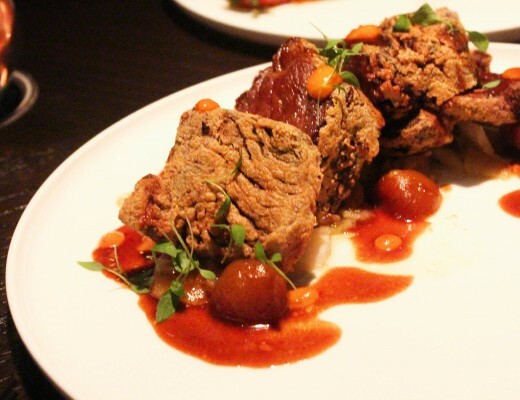 It was neither dry nor gamey, and reminded me of succulent, seared duck in French cuisine. 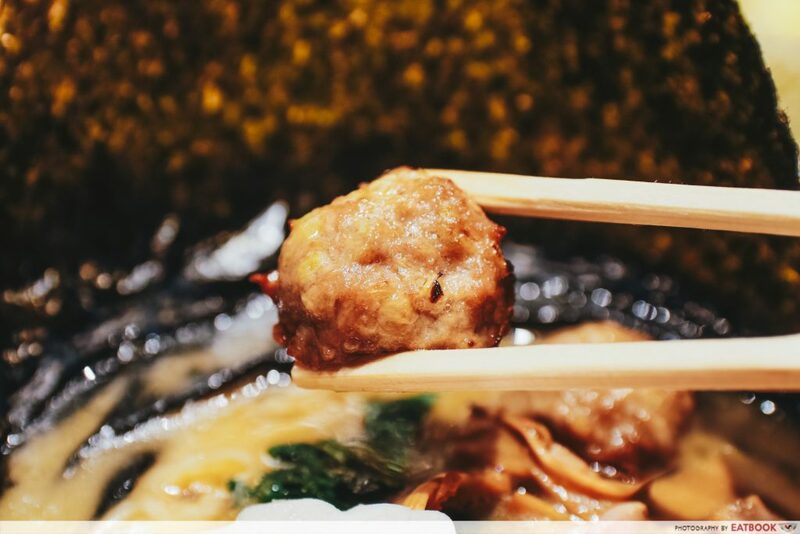 The real star of the show was the yuzu duck meatball. Grounding breast meat and thigh meat together with Japanese leeks and freshly grated yuzu, the plump meatballs were so tender, my chopstick met little resistance when tasked to split it apart. The introduction of yuzu was a smart move, as its perfume-y flora aroma and bitter pithiness invigorated the simple dish. If you prefer dry noodles, order the Hybrid Duck Maze Soba ($14.90++). Tearing open the fried seaweed dumpling, velvety egg yolk flowed out, coating the noodles, chopped steamed duck slices and bamboo shoots. Having it on its own was rather meh, which was why the dish came served with house-made chilli oil, orange vinegar, and orange mayo. Each of the condiments played a part in cutting the richness of the noodles, by either imparting a little bit of heat or a pleasant tartness to the otherwise boring dish. We were also served the Kamu Ju ($29.90++), which came presented in a lacquered box. 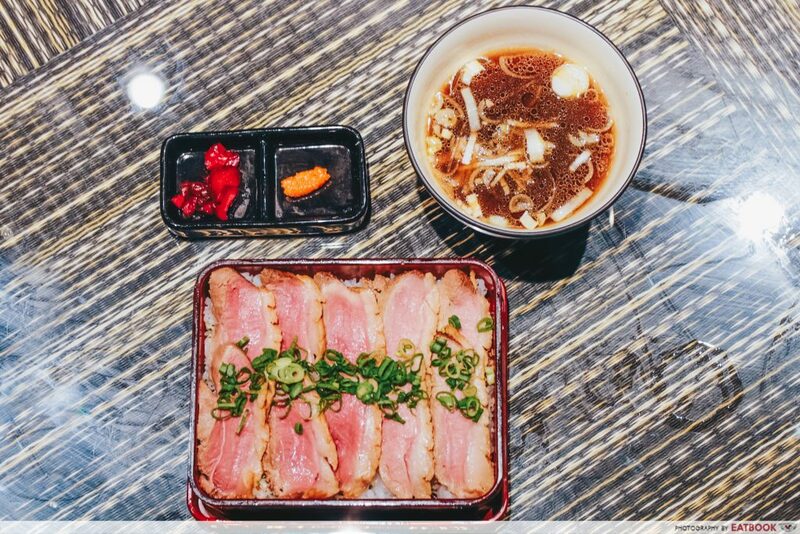 On a bed of rice were thin slices of fatty duck as well as minced duck. It didn’t look visually enticing and I was feeling quite bored from the “duck party” I was attending. But once again, Chef Keisuke surprises. Biting into the dish, a refreshing, citrusy bite slowly built up at the back of my throat. 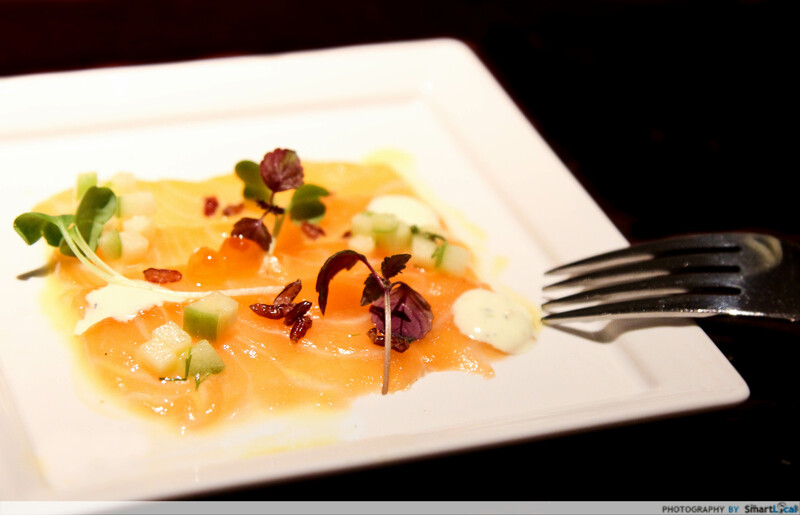 I asked, “Did you add yuzu into the dish too?” To which I was met with a humble no – it was grated wasabi. A majority of Keisuke’s outlets are found in shophouses. 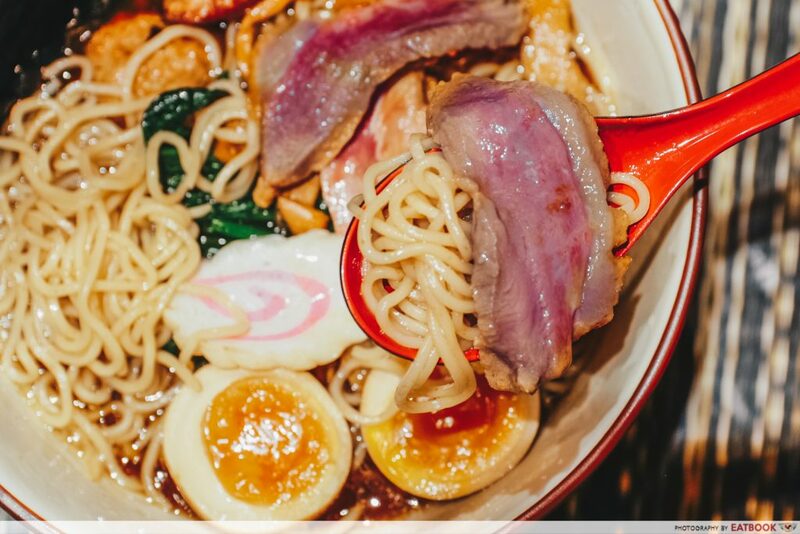 And this 32-seater, dedicated duck ramen restaurant is no different. Located above Holland Village’s Coffee Bean, the restaurant was beautifully decked in Japanese furnishings and decor. 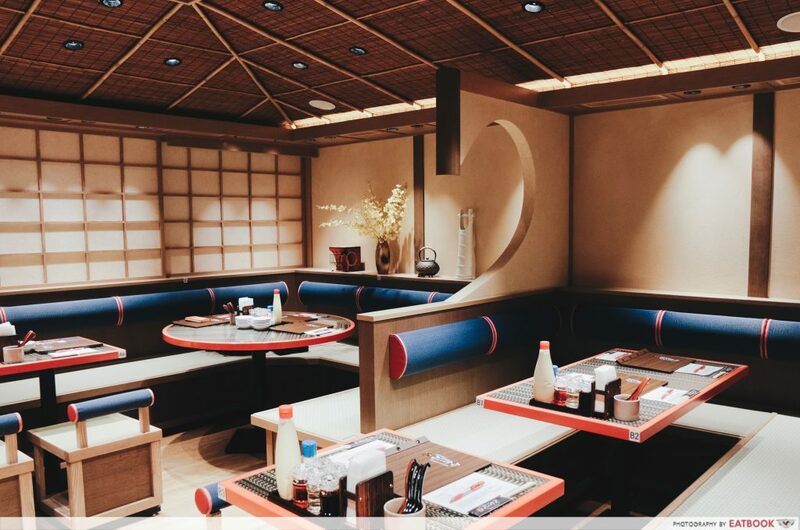 The teak ceiling and panelled walls gave it a traditional vibe, while the touches of blue and red, both of which symbolises luck in Japan, helped brighten up and contemporised the space. 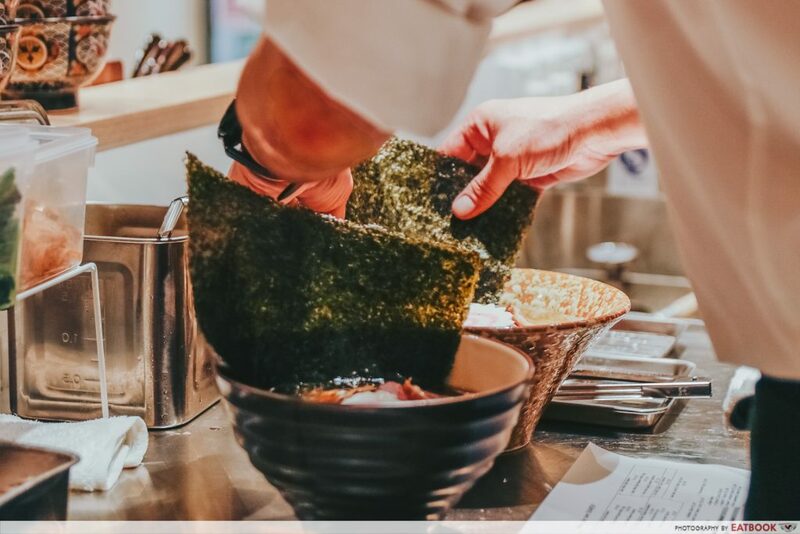 Keisuke is currently in the process of building a Japanese rooftop garden bar upstairs, so you can knock back a few glasses of sake, before settling your belly with a bowl of Keisuke’s scrumptious ramen. Everything at Kamo Soba Keisuke was delicious! 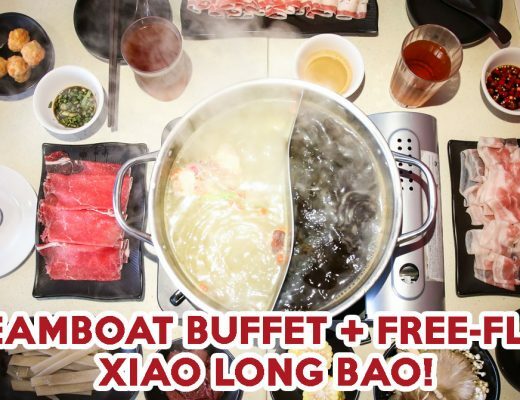 The only qualm I have is the pricing, especially for the quantity you get – we only had two slices of duck and two pieces of meatballs for the Special at $19.90++. I can’t imagine feeling satisfied if I ordered the regular bowl at $14.90++. But I guess this is the price you have to pay if you want quality food that took painstaking hours to prepare. And I will gladly pay this amount over and over again. 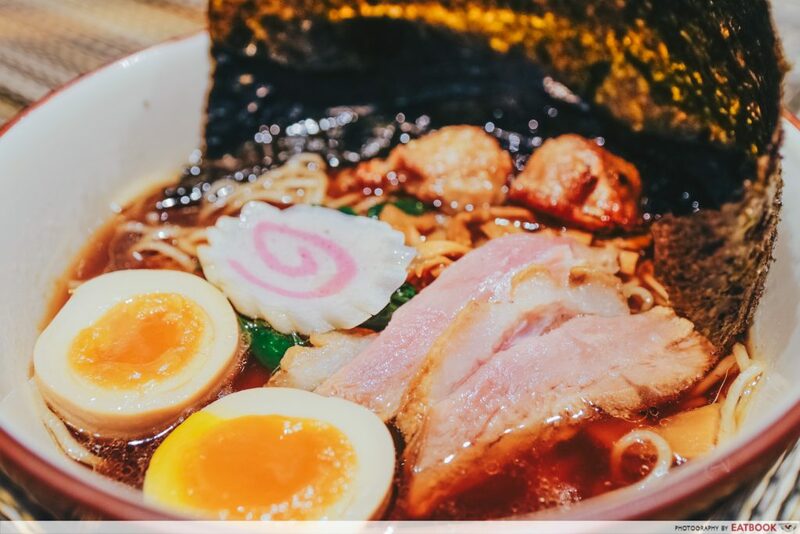 If Kamo Soba Keisuke is over your budget, check out these cheap ramen places in town or Supreme Ramen Xiao Long Bao nearby! This was a media tasting at Kamo Soba Keisuke.